31 McKinlay Crescent is a spacious 2 bedroom upper flat, offering excellent accommodation in this sought after area, close to all local amenities and benefitting from spacious rear garden, off street parking and timber garage. 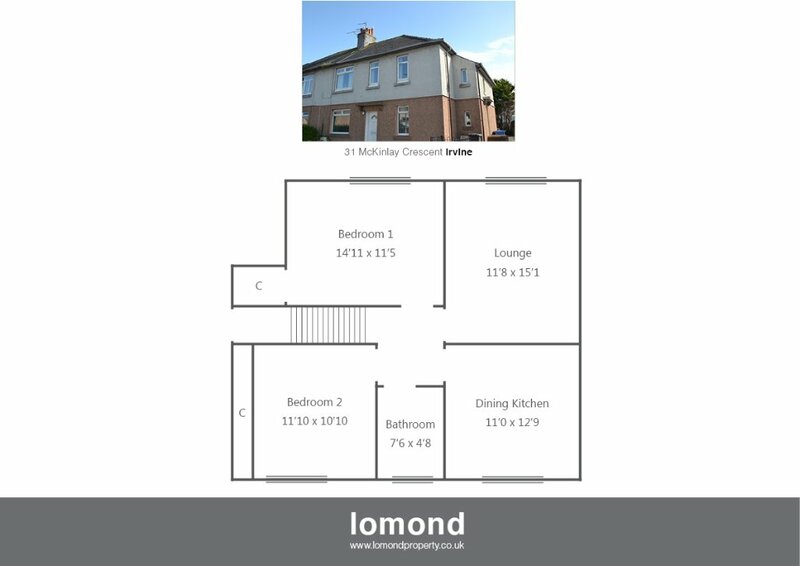 In summary the property layout extends to lower hall with stairs leading to the upper level, spacious front facing lounge, rear facing dining kitchen with integrated oven, hob, extractor and fridge / freezer, two double bedrooms and family size bathroom. A spacious loft space is available and may hold potential for further development subject to local authority consents. Externally the property has a spacious garden plot to the rear, with timber garage for storage and off street parking. The property benefits from double-glazing and gas central heating. McKinlay Crescent is a popular residential area. Irvine town is close by and provides access to a range of amenities including supermarkets, bars, restaurants and town centre shopping. There are a number of local primary and secondary schools with the greater Irvine area. From Lomond's office on Bank Street take right at the traffic lights onto East Road. Continue through the next set of traffic lights and at the mini roundabout take right onto Burns Street. Take left and the traffic lights onto the A737. Take the second exit at the Marress Roundabout and continue under the shopping centre. At the next roundabout continue straight through and take right onto McKinlay Crescent.